Celebrating baby’s first Christmas is wonderful tradition. Honor it and remember it with one of these beautiful photo ornaments. Parents, grandparents, relatives and friends will appreciate celebrating this first Christmas with the little one. Whether your little one is a newborn or just about to cross her first year, a photo ornament to remember this extra special holiday is always welcome. These are some of those special favorites and popular ones. Just pick the one you like best, upload your own baby photo and insert the details, name, date, etc. You will have a great remembrance for years to come. As parents, we always looking for those great gift ideas that our delightful baby can give to grandparents, relatives and friends. A personalized photo ornament to share in that first Christmas is an ideal choice. Once you load the photo and enter the details, you can order just the number you need. No extras leftover and plenty of charm to give away. 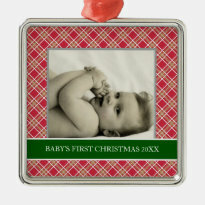 Baby’s first Christmas photo ornaments make a great choice as a gift to the baby. Well, we all know it’s really a gift to the parents, but we also know this child will be able to enjoy his first Christmas for many more years. Another cute gift idea is a Baby’s First Christmas t-shirt or onsie. Goes well with a photo ornament! With every child, those special milestones in their lives are things that always want to remember. And that first Christmas is no exception. Every year, my own tree includes those special first Christmas ornaments from each of my children. It’s a wonderful treat to get them out each year and hang them in places of honor on the tree. Now my collection includes my grandchildren and I couldn’t be happier. So don’t hesitate to pick out your favorite design and make that personalized photo ornament to celebrate baby’s first Christmas. In the years that are ahead, you will be glad you did. The Baby’s First Christmas ornament is such a very special ornament and keepsake! I love the idea of it being a photo ornament too. Such a treasure! I still have both Baby’s First Christmas ornaments from my kids and they get a special space on the tree each year. I wish I could have designed one myself back then with a photo and everything! These are awesome!